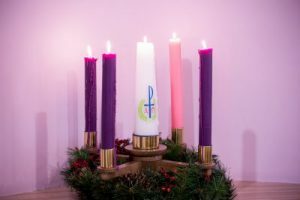 On this first Sunday of Advent, we begin to prepare for the story of Jesus’ birth with the strangest of readings, near the end of Luke, and just a few lines before the story of his death. He predicts persecution for the disciples. He says “Woe to those who are pregnant and to those who are nursing infants in those days.” Woe is right! As in whoa! Ease up, man! We haven’t even digested our Thanksgiving leftovers! So much for ‘little baby Jesus.’ Instead, we’ve got super serious, super stern sounding, adult Jesus. What’s more, he goes all kinds of end-timey on us, here! What does it all mean, especially now in the troubling times we are living in? This Advent season, we are called to see these troubled times not just as our time, but as God’s time as well. That long view of time which spans millennia and generations, a time which encompasses memory and hope, with God as our mercy and our judge. The season is about God’s coming to us, to be sure, but it’s also about our coming to God, about our coming to Jesus, returning year after year, and perhaps especially this year, to his prophetic voice of hope, to his way of radically inclusive love, to the long view of human history and with it the long view of our human redemption. May we heed his call to be on guard, and to be not afraid. May we draw near to that already and not yet day of God, even as it draws near to us. Amen.